Tracker Rental for Return Delivery bookings are non-cancellable and non-refundable. Trackers and related systems are subject to performance issues and failure modes, and Vic-Maui can not and does not make any warranties or representations with respect to trackers and related systems. If you have any questions about tracker rentals, please contact trackers@vicmaui.org before making your booking. Vic-Maui will provide and install a tracker on each boat in Victoria for use during the Vic-Maui race, from Victoria BC to Lahaina Maui. The use of the trackers during the race is included in the boat's race entry fee; no booking or rental is required for the race from Victoria to Maui. Boats are responsible for looking after the trackers. Each boat will arrange with Vic-Maui to have the tracker removed in Lahaina. Trackers are available for rental for the return delivery. Having a tracker onboard for the return delivery, automatically reporting the position of the boat at intervals, may give peace of mind to family, friends and boat owners who are stuck onshore. It may also provide a safety benefit in the event of an emergency at sea. 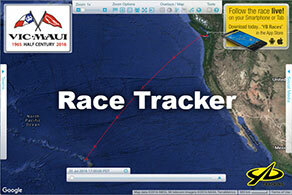 Boats that are renting a tracker for the return delivery after Vic-Maui will receive a re-charged tracker in Lahaina. After the return delivery from Maui to their home port, the boat is required to deliver the rented tracker at their own risk and expense to the Royal Vancouver Yacht Club main clubhouse. Rented trackers must be received by Vic-Maui no later than August 26, 2016. Vic-Maui has used YB trackers since 2012. YB trackers run on the Iridium satellite network, and are used in many races including Fastnet, Newport Bermuda, Chicago Mackinac, Sydney Hobart and the Clipper Challenge. For more information on YB trackers, please visit www.ybtracking.com. For questions regarding renting or returning Vic-Maui trackers, please contact trackers@vicmaui.org.